An accent chair of comfort and style, this swivel chair offers a quick and easy way to finish a room. With its deluxe seat cushion and high attached back, this chair wraps your body with the soft support it needs to relax. 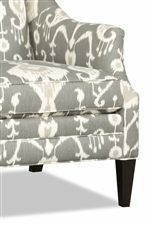 Where style is also key, flair-tapered arms exude a transitional style that everyone will love. Place this chair in the corner of any room or position it next to your living room sofa for a welcome addition of comfort and style. The Lark Transitional Skirted Swivel Chair by Sam Moore at Reeds Furniture in the Los Angeles, Thousand Oaks, Simi Valley, Agoura Hills, Woodland Hills, California area. Product availability may vary. Contact us for the most current availability on this product. Fabric Options All frames are available in 600 different covers. Pillow Pillows are available at additional charge in any of our 600 fabrics. There are several sizes of pillows for selection. We have two fills poly fiber and blend down fill. Padding & Ergonomics Deluxe Cushions combine high density foam and polyester fiber, creating a thicker cushion with a larger crown for increased comfort and beauty. The feminine, flared arms of the Lark chair caused such a stir, that we expanded this design to include a skirted style, swivel chair, and swivel glider in addition to the model with exposed wood legs. This gorgeous, transitional-style chair is furnished with our Deluxe seat cushions, a look with a plush crown and a soft, supportive sit. The Lark collection is a great option if you are looking for Transitional furniture in the Los Angeles, Thousand Oaks, Simi Valley, Agoura Hills, Woodland Hills, California area. Browse other items in the Lark collection from Reeds Furniture in the Los Angeles, Thousand Oaks, Simi Valley, Agoura Hills, Woodland Hills, California area.